About a year ago, I called Dr. Giuseppe Greco, a major historian on our ancient history, to thank him for his labour of love in uncovering so many wonderful details about our ancient past. Dr. Greco, in his inimitable, humble way replied that his work was built on the shoulders of giants. In time I realized that he was being truthful. We owe much to many ancient historians and especially to Calabrian historians, such as Barrio, Marafioti, Fiore, ecc. who centuries ago wrote detailed histories of our Calabrian people. We also owe much to academics of our days that focused specifically on the history of our area: the Angitola Valley. Among such, I want to first of all offer my deepest gratitude to the above-mentioned, venerable Dr. Giuseppe Greco, from Maierato, whom I had the pleasure of visiting in the summer of 2010. Though he was battling the results of a serious paralysis, due to a stroke, his mind was impressively sharp and his ability to recall details from ancient works left me astounded. I also want to thank a special, young archeologist, Cristiana La Serra, who has written an impressive thesis on the Rocca Angitola and other nearby locations. In my view, she is well on her way to becoming the foremost expert on the history and the archeology of the Angitola Valley and I am sure she will uncover still more in the future that fill some of the gaps that still need filling. Her father, my relative and friend, Pino La Serra, has provided me with information, maps, and books that have proven invaluable in my search. He is the kind of friend we all should have. I also have benefited from the work and insights of an anthropology professor from the University of Calabria, Dr. Vito Teti, who originates from one of the Angitola Valley towns, San Nicola da Crissa. There are many others whose works have been quoted that space does not allow me to mention. Their works will receive due acknowledgement in the Bibliography. Lastly, I want to thank my wife and children who patiently bore my obsessive pursuit of this new project. Thank you, Leonilda, Anthony, Julie and Victor. You are greatly loved! The following section has been quoted from the book, THE COIN FROM CALABRIA: DISCOVERING THE HISTORICAL ROOTS OF MY CALABRIAN PEOPLE, by award-winning author, Michael Caputo. The book details many enthralling events in the history of Calabria, a magical Region in Southern Italy, all the way back to the sixth century B.C. 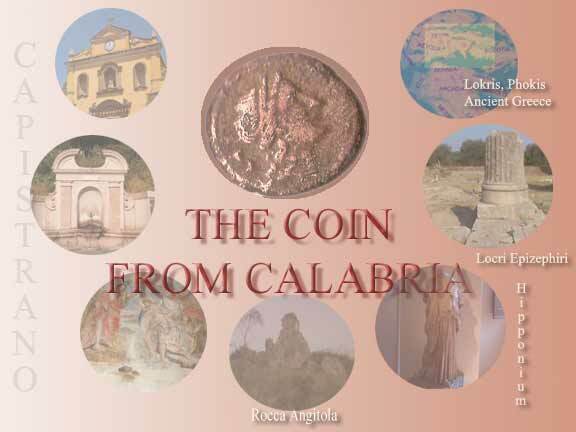 THE COIN FROM CALABRIA is a very enlightening book for people who find their roots in Calabria, that want to know more about their ancestors' history. It is also enlightening for anyone who is interested in exotic lands and cultures. Both the paperback and e-book versions are available on Amazon in your country. Read info at the end of this page. I am starting this book on Dec. 31, 2009, around 5 PM, in a suburb of a North American city. The New Year is fast approaching. Soon some family members will come to have dinner with my family. Before the evening begins, I would like to start something that is near to my heart: a book about a coin, the search to find its origins and the thrilling discoveries that followed. I have asked myself why I would want to write and publish such a work and I have concluded that there are three fundamental reasons. First of all, I want my children to know, in detail, and in greater depth a story that I shared with them several times, but never did in a complete and orderly way. It would also be a wonderful opportunity to teach them about their ancestors on their father’s side. I also want to help the great many who share the same genetic and historic roots to get to know their enthralling ancient past and who are presently part of our Diaspora around the world. Lastly, I would like this book to become a source of inspiration for all who crave to know more about their ancient roots. As I will show in this book, patience, determination and a systematic approach can lead to uncovering wonderful nuggets about one's ancestors; nuggets that now more than ever can be uncovered with the help of rich libraries and the Internet. I hope my labour will prove to be enlightening to my children, my relatives and all of those with whom I am genetically related. Equally, I hope that all who will read this book will be stirred to dig through the various historical layers that are waiting to amaze the determined digger. Many years have gone by, since the events you will read about in this book took place in a far away location. I lived in that location as a child until age 14, when I left for another land. Since then I have been welcomed by another people that treated me like a son. I have been cared for and have been given many wonderful opportunities. Life has been good to me in Canada. I have a wonderful teaching and counseling profession; I am financially comfortable and I have been able to raise a special family. But, often, my thoughts fly back to a little town in a country far away where some of my happiest years were spent and where I had some of my most unforgettable moments. One experience hangs in the most central part of my mind. It started on a hot summer day and it gave rise to a chapter in my life that keeps on being written to this day. The story begins in 1963, or 1964. I was either ten or eleven. It was another very hot and uneventful summer day in the town of Capistrano, in the last southern region of Italy, named Calabria. I had made my usual morning tour of the piazza nearby; I had strolled north and south on the main road, the Via Nazionale. I stood on the edge of the Via by the waist-high stone wall that kept us kids from falling down into a steep ravine below. I looked down the long, meandering valley and then raised my eyes toward the Rocca Angitola Mountain and the distant blue Mediterranean, as I had done a thousand times before. I paused to inspect the digging in the ravine below. The eager workers were clearing the area for the high pillars that would have held up the Mayor’s house, and that would have brought it to road level. It was just another boring day, with little to do but wait until, as usual, one of us kids would have thought of something to do, to add some fun to the monotony of another summer’s day. I remember being in front of my house, near four corners, when one of my young friends approached me, all excited. Was it Raffaele, or Modesto or maybe Mimmo? I don’t recall. I do recall, though, that one of them came to announce a dramatic, life-changing event. He had found some old-looking coins in the ravine where the Mayor’s house was to be built. My friend looked elated, as he recounted the visit down the steep ravine and his amazing find. Filled with childhood curiosity, he had gone to simply look around and, upon glancing at the moist, dark dirt, he saw something he had never seen before: an old-looking coin. He stooped down, looked attentively and then collected it with excitement; but there were more – several more. He continued looking and finding for quite some time. When there were no more to be found, he ran hastily to share the stunning news with his closest friends -- and I was one of his lucky friends. It was not a kids’ trick meant to break the day’s monotony; the evidence was there, in his trembling hands. Sure they were dirty and very old looking, but they were real and they looked like nothing we had ever seen before. A close scrutiny revealed that they were old, Italian coins. 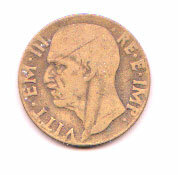 The heads on the coins were those of past Italian kings. The names were visible and so were the dates. The newest ones, showing the last King of Italy, Victor Emmanuel III, were just a few decades old; the oldest ones showing Victor Emmanuel II went back about one hundred years. I stared at the coins mesmerized. I had never seen such amazing, old coins before. To my delight, my friend let go of them one by one, to let me touch them, to read the names and the dates as evidence that he, indeed, was the proud possessor of an amazing treasure. Within minutes, the group grew and so did the excitement. We all agreed that the ravine must have had more coins waiting to be found and, as we had done so many times before, we went on to tackle our newest adventure. The ravine was nearby. The fastest way to get to the bottom was the stone and concrete staircase beside my house. We ran quickly down the steps and reached the promising area within seconds, ready to search and find more coins. Four corners and the Via Nazionale. The tall, green house is the former Mayor’s house. The coin was found where its foundations now rest. All of us looked around with eager eyes and soon found what we were looking for. In spite of all the coins already found by our friend, the dirt offered us many more. We searched for a long time and, to our delight, we found many more. Each time our eyes landed on another coin, we proudly yelled, "I found another one," for all to hear. Soon our pockets were full and our young hearts were filled with joy. Then the coins became rare and, when it became clear that could not find any more, we left satisfied. We then walked to the nearby fountain to wash the bounty thoroughly and to check the dates. By late afternoon the unavoidable competition began. Who had found the most coins? 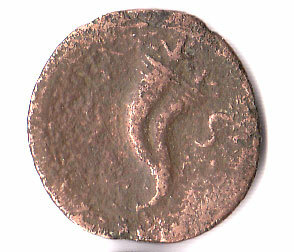 Who had the oldest coin? Unfortunately, as I vaguely recall, that honor was not mine, though I did have in my possession several old coins. We went back the next day and maybe the day after. A few more coins were found but, in time, the coins dried up and, since digging was too time consuming for our impatient group, the search came to an end --- except for me. You see, I was the lucky one; I lived right next to the ravine. In fact my bedroom faced the very spot where the coins had been found – and I was very persistent. Coins of King Victor Emanuel III, King Umberto, and a Vatican coin found during my search. My ten-year old logic told me that more coins were waiting to be found. So I conceived a system that was quite ingenious for a ten year old. I would dig a hole around half a foot deep. I would then create a small vertical wall on one side of the hole and I would slowly scrape the dirt off the wall with a twig. It would have taken time and much patience – but I was in for the challenge. Being totally alone, I could focus on each grain of dirt and each pebble. I treated the miniature wall with the respect one owes to any fragile object and dug slowly and gently. The dark, moist dirt scraped off easily. I inspected closely anything that looked like a clump of dirt. 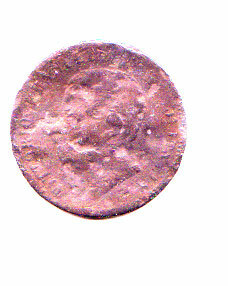 I knew that the dirt would have built up around anything hard, especially metal coins. Dirt, stones, twigs and other parts of indefinable objects had been deposited over a great many years, layer after layer, by the flood of water that would gather from the upper part of town into a vertical tunnel beside the main road. There it would drop several feet and then flow into an arched tunnel under the road, where it would flow to the edge and then drop about ten feet into the ravine where I was digging. I felt the twig touch something hard. I looked closely. Was it just another pebble, a clump of hard dirt or was it something else? I pushed the twig gently behind the promising clump and pushed it out of the surrounding dirt. I then picked it up with eager fingers and inspected it closely. At first glance, it looked like a dirt-encrusted button; but it felt heavier than a button. I rubbed my fingers against both surfaces, but the crust was very hard and would not come off. I was so intrigued by my find that I stopped the dig. I rushed up the steps on the side of the ravine and I walked hastily toward the nearby fountain. I washed and scrubbed and washed some more. Gradually the hardened dirt wore off and my hopes were validated. It was not a button -- it was another coin. The irregular circle framed what looked like an ancient face, like the ones I had seen in history books. On the other side appeared what looked like a horn-like shape. I became quickly convinced that it was a very old coin; without doubt older than all the ones that had already been found. Proud of my discovery, I rushed to show it off to my friends. Without doubt, I had suddenly become the undisputed winner of the coin war and I wanted all to know. I shared the find with all my friends and they looked at my coin with tangible envy. This time, victory was mine. Given the amazing find, we probably went back for more but the search may have been in vain. I do not recall sharing my technique with anyone. I probably guarded it jealousy for future use. I returned another time and continued the search but, finally, even the technique failed to produce more fruit. Happy with my find, I rested on my laurels. Not long after, deep holes were dug into the ravine’s dark ground and, afterwards, the workers poured cement into them. Tall wooden casings were nailed together and finally pillars rose to road level. Soon the first floor was shaped and finally the location became inaccessible. Some of us hopeful kids continued seeking down the rugged valley past the Mayor’s house and found a few more rusty and consumed old coins, but nothing more. Finally the search for ancient coins was officially over. In the few days that followed, the excitement of the finds gradually waned. The time had come for another adventure. Someone suggested a related activity: searching for old stamps. We all found it to be a great idea and another adventure began which kept us busy for several more weeks. The coin was still covered with a brown film that would not wash off. Its total beauty and specific age were yet to be uncovered. But soap and water had not been enough; something more powerful had to be found. One day my parents went to visit the city of Vibo Valentia, the largest city in our area. My father and mother went to shop at a store on the main street. Nearby I noticed a hardware store. I told my parents I would have gone next door to buy something and they allowed me to go. I quickly went to the hardware store, walked to the back and asked a clerk if he had anything strong enough to clean metals. He did. He looked on the shelf behind him and found a small bottle. I bought the promising bottle which contained a milky substance. I was eager to go home to try the miracle liquid, to see what else was hiding behind the dark-brown film which still covered my precious coin. Once home, I immediately poured a few drops of the promising white, thick substance on one side and quickly wiped it off with a cloth. A black stain appeared on the cloth, while, simultaneously, a stunning, clearly formed head of a woman appeared on that side of the coin. I do not recall if I repeated the process more than once. I vaguely remember being concerned that such a potent substance could have eaten into the coin and could have damaged it; so I stopped using it. There was no doubt about it. The head was that of someone ancient; perhaps someone from ancient Rome. At that point I knew for sure that I had a real winner but, unfortunately, I could not see any date. The only thing I could see was what looked like a “5” or an “S” on both sides. More proud than ever, I put the coins in a small metal box and I hid them in a well-protected location. The coin and stamp collecting phase may have come to an end but we children were soon to enter the most exciting time of year: the Madonna celebrations which took place the second Sunday in August that all of us Capistranesi, young and old, longed for every year. The special celebration is known to us as, “La Festa della Madonna della Montagna” (The Feast of the Madonna of the Mountain), also known as “La Festa della Madonna di Polsi” (The Feast of the Madonna from Polsi). This was a joyous, yearly event meant to honor Mary, the mother of Jesus and her statue found on the central altar of the main church. The statue is dressed in a stunning, shining, light-yellow, flowing dress and a blue mantle, both of which, without doubt, are made of high-quality cloth. The crowned Mary sits with a regal posture inside a glass niche illuminated by soft, warm lights; her face is pink, soft, youthful and loving. Her baby Jesus stands erect on her left leg, clothed with a shimmering, somewhat feminine yellow baby dress, but with a confident, divine demeanor. Most Italian towns worship Mary but with slight variations. They are all given a somewhat different name; they have a somewhat different look; their dress is somewhat different. Yet they all have the same reassuring and very loving, motherly look. Our very special Madonna was, “Mary of the Mountain.” She was “our” Mary and to us she was special above all others. To us Capistranesi she was the ultimate source of comfort and we all took time to visit her in the church, whenever possible, to bathe in in her warmth and in her love. Of course, we tried not to give much importance to the fact that our Mary had, in actuality, been imported from another Calabrian town and, thus, her other name: “La Madonna di Polsi” (The Madonna from Polsi); Polsi being the name of the town it had been worshipped in, long before it began being worshipped in our town. One of the most popular traditions tells us that in 1144 a farmer, in the Polsi area, was desperately searching for his lost bull and finally found it kneeling on the ground, before an iron cross it had dug out of the ground. The farmer, moved by what he saw, got on his knees and started praying and, while doing so, Mary appeared to him and shared with him her wish that a church be built on that location. The church was built; a very heavy statue of Mary was sculpted and she has been worshipped in Polsi ever since. In the 1700’s a priest by the name of Don Domenico Zerbi was assigned to serve in Capistrano. In July of 1757, he went to Polsi on a pilgrimage and brought back to Capistrano various icons of the Madonna, which were placed in the local church for worship. In time a statue was commissioned. The sculptor who took on the job was maestro Antonio Reggio, who came down from Naples to accomplish the task. The very beautiful statue was finally delivered and was consecrated the Sunday after Easter, in 1759. Since then the statue has become the most beloved sacred object in our town. The image remains chiseled in the hearts all of the Capistranesi around the world who have retained their Catholic faith. Most of them return home, when possible, to see their families and their special mother, during the time of the “Festa della Madonna della Montagna” (The Feast of the Madonna of the Mountain), which takes place the second Sunday in August. We who grew up in the town, no matter how long we’ve been away, vividly remember the Madonna Festa from days gone by. We treasure the images of the light-covered arches constructed over the major streets for the occasion; the round stage in the main Piazza, covered with its wooden dome adorned with streams of lights shooting upwards toward the peak. We fondly remember the bands that came to perform for the occasion, the singers that livened the evenings with classical and popular songs and, most of all, the procession through the town. On Sunday afternoon, the glimmering statue was slowly carried by strong men through the major streets, while the band played the unforgettable, lively tune, taking turns with the ladies who sang the brief prayer of intercession to their heavenly advocate. The attachment to this statue is so strong that the two biggest Capistrano communities abroad have each commissioned a replica of their beloved Madonna and, on the second Sunday of August, they gather in parks in both Toronto, Canada and Melbourne, Australia to celebrate “their” heavenly mother, as they did back home. But, not very long ago, the story has taken an unexpected twist. A few Capistranesi in the Australian community who read Jehovah's Witnesses' material, concluded that one of the Ten Commandments forbids the worship of statues and pictures. As a result, they stopped participating in the Madonna's celebrations, and then went on to share their beliefs with others in the community who also embraced their ideas. The number of Capistranesi who left Catholicism apparently became so large that the Melbourne celebrations stopped altogether. In the future, will the same fate assail the Toronto community, and their Madonna celebrations? Time will tell. One day, probably not long after school started, I brought my ancient coin to school. I had shown it off to my fellow students. I believe I also wanted to show my teachers how special I had become. I may have been only ten or eleven, but I was not the kind of kid who would separate himself from his treasure simply to ingratiate himself with a teacher. I knew instantly what he was up to and refused to go along with his game. “No!” I said firmly, with a pleasant but fake smile. That was "my" coin and no one was going to take it away from me, and that included the one who had finally given it an identity. The teacher did not insist. He knew when a "no" was a definite, "no" and I made it very clear that my "No!" was very definite. From that day on, I never again brought my coin back to school and, never again, as far as I can recall, did I show it to anyone else in my town. The new school year began. New teachers appeared. My new art teacher, Franco Natale, a local teacher, was wonderful to have. He was brimming with energy; he was confident, creative and always warm and friendly. He belonged to the Natale family, a family of exceptionally gifted people, artistically and musically. His grandfather was Maestro Natale, who many years ago had been the town’s Postmaster, the town’s Mayor and the Maestro of the local band. My father, who knew him well, described him as eccentric, intense and brilliant. His genes clearly were passed on to several of his descendents who later excelled in various fields. Franco was particularly gifted in art. He had discovered his artistic talents while in the police force. Later he became an art teacher and I had the privilege of being one of his students. Little did we know that tall, dynamic and enthusiastic man, many years later, would have become a successful artist who would have won several art awards. We had no idea of who Renoir had been, but we knew that he had to have been an important painter. It was also evident by the name that he was not Italian. What was a foreigner, who obviously had to have been very important, doing in a small town located among olive groves, in a far away land? It was a puzzle, but at our young age we did not really care. Mr. Natale announced that he was planning to ask the people from the Ministry of Fine Arts to come and look at the mural, so as to validate his views. I stored the announcement in the same location of my mind where the name of my coin had been stored, so as not to be forgotten -- and it was never forgotten. Probably the summer that followed, while I was playing in the piazza, I saw Mr. Natale, Don Nicolino Manfrida, our parish priest, and two authoritative-looking people enter the church. I was quite sure Mr. Natale was showing them the mural. I do not recall how long they stayed in the church, but I immediately suspected that they had to have been the people Mr. Natale was hoping to get to come and investigate. Of course, I had no way of validating my suspicion and to today I have no idea as to who they were. I heard nothing about their verdict. But I did not forget the evolving story. I kept all the details stored in my mind. The verdict was finally rendered several years later. Upon my return home, many years later, I found that Mr. Natale's views had been validated. The consensus was that Renoir, the famed French impressionist painter, had indeed come to our town and that he had totally re-painted parts, or all of the mural, as his son had written about in his biography, Renoir my Father. I have recently discovered that, in reality, Mr. Natale had not been the first one to conclude that Renoir had visited and had done some work in my town. Two teachers by the name of Giovanni Curatola and Giuseppe Pisani, who were teaching in Capistrano, and a journalist by the name of Sharo Gambino had reached this conclusion before Mr. Natale, upon reading Renoir's biography. Mr. Natale was informed of the possibility by his two colleagues and he too quickly became a firm supporter of that view. His stay in Calabria and my town must have been exceptionally positive. His final assessment of my people gives me a deep feeling of sadness and pride. “All the Calabrians I met were generous and so cheerful in the midst of their poverty.” Though Calabrians in those challenging days lived in abject poverty, they coped with the paucity in their lives with cheerfulness and were very kind and giving people toward strangers. In recent years more evidence of Renoir’s visit to Capistrano and of his work on the “Baptism of Jesus” and other murals has been offered by the local artist-philosopher, Mario Guarna, in his book Gli affreschi di Renoir a Capistrano (Renoir’s Frescos in Capistrano). In his book, Mario proposes interesting stylistic evidence to support the presence of Renoir’s touch in some of the frescos found in the church. The fact that Renoir came to Capistrano and that he left his artistic witness in the main church became a source of great pride for my people who had, up to that point, so little to be proud of. The square where I spent so many special moments as a child was renamed, “Piazza Renoir.” Presently tourists that tour our area of Calabria are, on occasion, taken to see the Capistrano Renoir, to the delight of many Capistranesi. The Baptism of Jesus; the mural repainted in part or in full by Renoir, while in Capistrano. 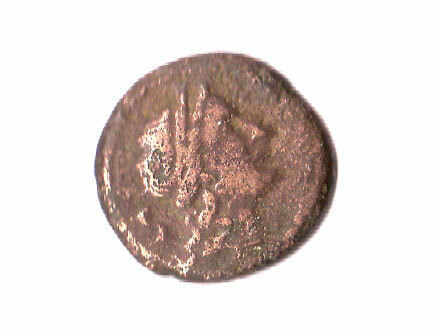 YOU MAY READ THE REST OF THE CHAPTER IN THE BOOK, THE COIN FROM CALABRIA, MENTIONED ABOVE. 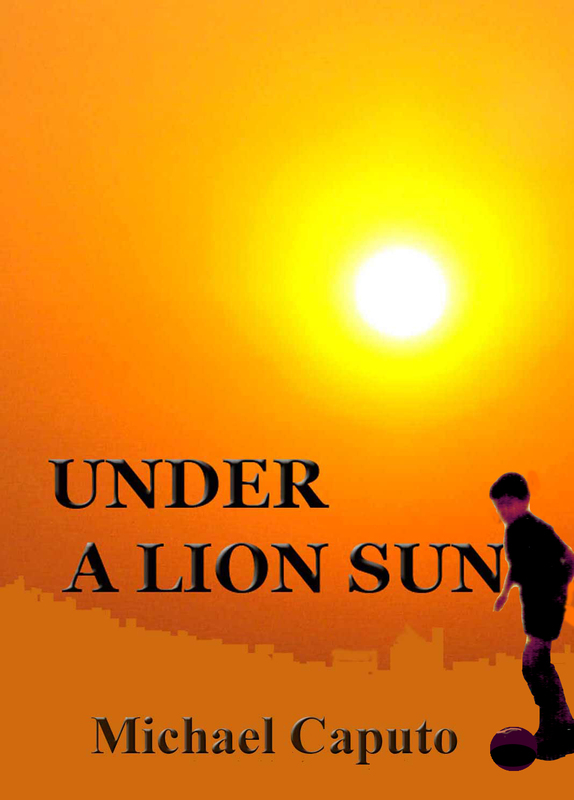 Enter another world through the eyes of Michelino (Meekehleeno), a boy who grew up in Calabria, the southernmost Region of Italy, during the fifties and sixties. Discover a society built on rigid expectations, where family and honor were paramount and where violence was all-too-often the favourite way to solving some of the painful challenges of life. In this book you will also learn about Calabrians' attitude toward food, discipline, education, destiny, the supernatural, exorcism, suicide, mental illness, the handicapped, crime, etc. You will also meet, among others, the following unforgettables: Maestro Fera, the teacher who had been an officer in Mussolini's army, who ran his class like a battalion. Nino, the Mafia Boss, who collected lovers like trophies and who was feared and revered by young and old. Toto' the brilliant mind who will never have the opportunity to excel, due to having been born on the wrong side of the fence. Salvatore, who was tortured by life since childhood, in ways that most people will never imagine. Tommasino, the gentle giant whose life was ended in a most shocking and horrendous way. If you are a descendent of Calabria you will return in time to the moments when your ancestors were torn apart by the curse of emigration, and you will become aware of the forces that shaped your ancestors that may have also contributed to shaping you. But the book does much more. It also traces how Calabrian customs and beliefs have evolved up to our time and how Calabrian society has moved forward in some respects while remaining fixed and immutable in others. By the end of this book, you will know Calabrians--their strengths and their weaknesses. You will grow to appreciate a people undaunted by life's many challenges; a people who takes pride in their stubborn spirit and their unwillingness to admit defeat, even if confronted by penury and great suffering.